What are the roles inside a tech company? What non-tech positions are available and what do they do. How to get recognized by a tech company. So you have an idea for a startup and want to hire a developer to build it for you? This guide is written for people who are either in the tech industry or want to get into it. This book’s purpose is mostly to give a survey of some of the key concepts that you need to grasp in order to be perceived as an industry insider, but it will not give you a complete explanation of everything you need to know. In fact, it may best be understood as “helping you learn what you don’t know”... but giving you enough information so that you can speak credibly in front of anyone in the industry, without having to bluff or make a fool of yourself. Maybe you’ve seen movies like The Social Network. Maybe you’ve seen TV shows like Silicon Valley, that intend to parody the world of tech but instead inadvertently glamorize it. Either way, you’ve caught the “tech bug”. Truth be told, salaries in tech are higher than in other industries. Perhaps in the 1980s the hot industry was Finance, with movies like Wall Street glamorizing that, but currently, the hot thing is technology, or “tech” for short. All the time, magazine articles are published about how child prodigies are making millions if not billions in the tech industry. And that provides a certain appeal: hey, if a punk kid can make millions with nothing other than the power of an idea, then maybe I can get rich too – and if not rich, then certainly I can make a comfortable living. Allow me now to dispel some myths. Magazine articles (and blog articles) are often the result of highly paid PR firms leveraging relationships with the media. Don’t believe everything you read. Just because someone is worth millions of dollars on paper doesn’t mean that they’re actually rich. The valley is filled with “millionaires” who own shares in companies worth many millions of dollars, but at the same time, can’t buy a home. Something is only worth what someone will pay you for it. We’ll explore stock options and some implications therein in later chapters. The vast majority of young super-rich are piggybacking off of their parents’ relationships. If someone makes the 30 under 30 list, you can pretty much guarantee that they either have a super wealthy or influential parent. Mark Zuckerberg, for example, was privately tutored in programming, lessons paid for by his dentist father. There was recently an article about a secondary school student who sold an app to Yahoo! For millions – his father is a wealthy investment banker who called in a favor. In the tech world, ideas are worth “nothing”. The only reason that the Winklevoss twins were able to successfully sue Zuckerberg is because they paid him to work on their idea and then he went and made Facebook. Other than that, idea creators get zilch, and rightfully so. In the tech world, being an “idea person” without any hard skills or ability to either (a) finance implementation or (b) roll up one’s sleeves and do some hard work to bring progress… is the tech industry’s equivalent of a “deadbeat dad”. The vast majority of startup employees will wind up with no money from their stock options, for various reasons that we will explore later. Moreover, because people often move to high cost of living areas in order to “get to the job”, the increase in salary is substantially offset by the high cost of living. Although “changing the world” and sincerely aiming for “making the world a better place” are traits that (according to data from Noah Wasserman, writer of The Founder’s Dilemma) actually lead to entrepreneurs being more successful, the truth is these traits are really only fundamental at the very top of the hierarchy, and that’s only because in order to make a billion dollars, you really do need to build something that affects everybody. Everyone else is probably just “drinking the kool-ade”, and in life just as in Jonestown, everyone dies in the end. Now that we’ve dismantled some of the delusions, now that we’ve shared some hard truths, we can share some good things about tech. Working in tech is very rewarding. You get a chance to build things that people use every day. It’s fun getting to see the results of your hard work “in the real world”. I love hearing “Oh, I have that app on my phone” or “My friend uses that app!”. Tech companies take care of their employees. Yes, this is a double edged sword: they care for you, therefore they are “infantilizing you”; it’s like a government “nanny state”, making all your decisions for you so you don’t have to make them for yourself. And all those lovely perks: catered meals, laundry handled for you? They’re just a trap to get you to stay late at the office. But the truth of the matter is the vast majority of corporations are run in an “evil way”; they want to exploit employees as much as possible, and we can’t really blame them for that. “Don’t hate the player; hate the game”. So if you’re going to be run ragged by an employer anyway, wouldn’t you prefer an employer who treats you nice? If you have the discipline to realistically value your stock options at zero, if you live frugally and commute from outside of San Francisco or New York.. or if you work remotely for a company in those high-cost of living areas, then you can really do well. But once you start making a six figure salary, you start to spend at six figure levels and suddenly you are attached to your job with “golden handcuffs”. Working in tech is intellectually rewarding. The problems you get to solve are both fun and nearly always applicable to the real world. If you like being an adult and making an impact on the world, you can do so in tech. Tech as an industry is growing. If you get into the industry now, you can grow as the industry grows with you. There are no dead ends, but the flip side of this is that you must be constantly improving your skills. As a desirable industry, it can be cutthroat and competitive. It’s normal for people to have to thoughtfully apply for over a hundred jobs before they match with a good fit. The “org chart” inside a tech company varies as the tech company changes in size. However, by the time a company gets to about 30 people it usually has members from at least one of each of the following tribes. If you are non-technical, you should check out “Marketing”, “Operations”, and “Human Resources”. If you are artistic, check out “Design”; if you have a financial background, “Finance”. If you have great people skills, then “Sales” or “Bizdev and Partnerships”. If you have a technical or engineering background, look into “Engineering” and “Product Management”. This team’s job is to communicate with the customer. They have to figure out who the customer is and what the customer’s needs are. These people tend to be very visually oriented, and you will often (but not always) find a lot of attractive people in marketing. Social media management falls under marketing. So does trade shows. Mailings. Managing growth and advertising. Blog posts and content marketing. Email communication. The website. All of this is “marketing” territory. Lots of marketing people have read books by Seth Godin. These people’s job is to make the product and the marketing communications look prettier and on point with the company’s brand. These people tend to be very artistically talented, and at a startup, they also tend to be skillful in terms of software. Some programmers a designer might be asked to know are Adobe Photoshop, Illustrator, InDesign, Sketch, Skitch (different from Sketch, Skitch is a tool for annotations), and Balsamiq Mockups. Sometimes, but not always, they can also be involved in the implementation of their designs – with HTML and CSS. These people’s job is the back office of whatever is being built. For example, at an insurance startup, the operations team is involved in the actual underwriting of the insurance and handling the customer’s paperwork. At a food delivery startup, the operations team is involved in the delivery of the food. For Operations roles, you don’t need technical knowledge. Attention to detail and organizational skills are far more important than technical aptitude. The exception is when the startup is serving a niche that requires specific expertise (such as insurance); however, most of this information can be learned within three months, on the job. This department’s role is a combination of sales and marketing. It involves building partnerships to distribute the company’s offerings and enhance the company’s brand. Technical knowledge is not needed here, but people skills (especially sales skills), creativity, and business acumen are absolutely essential. This department deals with funding the business and managing the day to day financial operations of the company. Usually, some sort of accounting credential is required to succeed here: undergraduate major, CPA, CFA, etc. No technical knowledge is required. This is the department that manages hiring and firing of employees, the recruiting process, employee benefits, and coordinating employee development strategies. Managing the “human” “resources”. Schools of thought such as the Harvard Business Review are generally proponents of using cutting edge psychological strategies to manipulate and extract the most possible value from employees. As a startup employee, you are naturally in an adversarial relationship with HR: don’t ever forget it, but be a good diplomat. The key is politeness. These people are responsible for the actual product. They keep KPIs or Key Performance Indicators on the product, and they prioritize how the product is developed in each sprint cycle. Having a math or technical background helps a lot for this role, and some programming experience is ideal, but ultimately not required. If you are interested in learning more visit www.ProductManagerHQ.com for training. Also, read the book Inspired by Silicon Valley legend, Marty Cagan. These people’s role is to sell the product to customers. They tend to be configured up into different roles: Business Development Representatives field incoming calls and qualify the customer, making sure the customer is a good fit for the company’s product/service. Account Executives then close the deal (truly: “begin the relationship”) with the customer. They tend to be managed by Sales Managers, who ultimately report to a VP Sales. QA, Front End, Full Stack, Backend Engineer, Mobile Engineer – explained below. One of them is usually designated “Team Lead”, but that’s not necessarily a Manager title. Program Manager – simply involved to facilitate communications between the teams. “VP Engineering”, “Director of Engineering”, “CTO” – these are typically the head honchos when it comes to the Engineering tree. Once you find a company you like, try to think of a way you could improve their business somehow. Make them a mock website, or design them some new icons and some new logos. Write a blog post that they could publish. Design a new feature with full wireframes and mockups – explanations of how the tech works, step by step. Implement something using their tech. Then, write a blog post about it, and post it on various startup news aggregators: reddit.com/r/startups; Hacker News; your local startup meetup mailing list, et cetera. Tweet the link to the company. Normally, even if the company doesn’t hire you, this will garner you the attention of hiring managers, especially if the work is well-executed. It all comes to down to remembering that at any company, there are real people who are hiring for the role. Usually, the hiring manager has a specific visual image for the person they want to hire, so it helps to look the part. If you’re going out for marketing, be well-dressed and fashionable (but conservative). For engineering, a hoodie and being unkempt can actually help. And so forth. Try to look through some pictures of successful people in the role you’re going for and emulate their “look”. Although there are widespread laws against appearance based discrimination, it happens every day and is extremely difficult to prove and enforce. If the company posted the job in the careers section of their website, definitely apply through that channel, but realize you should supplement your approach. Follow the company on social media. This means Facebook, Twitter, LinkedIn, Instagram. It also means that you need to make such accounts – and be sure to purge them of any office-inappropriate content. Startups are kind of double sided in that regard: they can project an image of youth and carelessness (“nerf guns!” “move fast and break things!” “failure is a stepping stone to success!”) but at the same time, they can be very cautious and conservative; after all, they are businesses. So make sure that your social media profiles are on point with your personal brand: the images of you are professional and they reflect the “look” of the job you’re gunning for. You post professional content, and if you post personal content, it is wholesome and family-friendly. If the company has a live demo of their product, try to use it if at all possible. Make an account – don’t use any bad words, use your real name, because often times there is someone monitoring all this information. You’d be surprised how many times I create an account, upload a file that says “testing…” and the CEO writes to me asking me what I am testing. So, be careful in your communication here, and know that every time you interact with their product, you may be monitored – the flip side is that it’s a chance to make a great impression. If you are going for a role in Product or Engineering, you need hard technical skills and proof thereof. No ifs, ands or buts. If you are going for a Design role, you need a portfolio and you need skills with the appropriate design software. If you are going for a role in Marketing, you need hard skills related to what you’re doing (social media, design, email software, ad platforms, etc.). Notice a theme? You want to call out the hard skills that are most relevant to the role. At a startup, there is almost no room for someone without strong hard skills. Your resume should be at most one page long and impeccably proofread (containing no typos or mistakes whatsoever). Because startups are often founded by people with an Ivy League pedigree (or similar), and Ivy League schools are attended by people with perfect scores on their SAT tests, they tend to have a culture – that starts from the top – of perfect grammar. So pay someone to proofread your resume if grammar, spelling and punctuation aren’t your strong suit. They really do need to be on point. Your resume needs to be visually attractive. If you are shooting for a job over six figures, it is worth finding a top designer on Craigslist and paying them $150 to improve your resume. In general, startups are terrible at hiring and generally optimize for a combination of aesthetics and substance (you need both). Using some detective work, you can usually figure out who the hiring manager is for a position. How, you say? Check LinkedIn by searching under the Company name. Definitely don’t be a stalker, but write your cover letter in a tone that alludes to being ‘clued in’. If the company is small (fewer than 15 employees), you should emphasize how your skills will benefit multiple departments – other than that, even if you do have cross-functional skills, try to put as much emphasis as possible on your one strong suit area (engineering, operations, sales, marketing, HR, design). Make sure your LinkedIn profile is fully setup (check the section titled, “Networking effectively with ‘nerds’” for tips on this). Follow the company on LinkedIn. If your headline involves that you’re looking for work, make sure the headline is tailored for the role you’re gunning for! Make sure you have an Angel.co profile. If the startup has listed their job on Angel.co, apply through that channel as well. Startup companies use both in-house recruiters and external recruiters. External recruiters are generally a large waste of time and are hated. Internal recruiters are company employees designed to help shepard and communicate with candidates through the recruitment process. Sometimes, companies will throw parties. If a startup has an event with an open bar (for example, at SXSW, or after a major tech conference) then it is secretly a recruiting event in disguise. Show up to these looking professional; build relationships, and when people ask “if you want to get lunch sometime”, realize that’s code for “I want to hire you and exploit your skills for economic gain”. So, shoot them your resume and it’s off to the races! A company’s hiring process can involve multiple phone screens or phone interviews, followed by multiple in person interviews, followed by an in person presentation. All of that is designed to remove candidates at each stage, and then, sometimes companies will hire you on for a “one week trial”, or simply as a contractor, in order to further vet your skills and reduce the risk of a bad hire. All of this is normal, but if a company asks you to do real work with them, make sure it’s paid labor. Have a business card, but don’t give it unless someone explicitly asks you for it. If someone gives you their business card, politely admire it and then place it somewhere for safekeeping. Even if you absentmindedly tear it to shreds during conversation, that is considered rude. Have a presence online. This includes, at a minimum, a LinkedIn profile. You should also ideally have an Angel.co page and a Twitter account. If you are into the software side of things, you should have a StackOverflow account and a GitHub account. A headline that describes what you’re looking for – DON’T INFLATE your abilities or skills! Ideally, references from previous employers. Go to meetups regularly and mingle. Don’t friend people on Facebook unless you felt a personal connection and it was mutual – if that’s the case, ask for their phone number. It’s okay to friend people on LinkedIn after you’ve met them at a networking event, and it’s also okay to follow up with an email (ideally as soon as possible). It’s okay to keep in touch with people you meet by following them on Twitter and making conversation there. There are basically two main ways that humans communicate. One way is through Power, and conversations about Power. Another way is through Rationality. Always be aware of what mode of communication you are engaging in, and why. If you are dealing with an engineer, you are best suited to use Rationality. If you are dealing with someone else, you are best suited to use Power talk. Nerds thrive on rationality, so avoid any status signaling and status display as much as possible, and use a logical argument devoid of logical fallacies. Also, be egalitarian. Don’t flex your muscles or power trip on them or it will backfire, “revenge of the nerds” style. Nerds really don’t mind taking you down in a lose-lose battle – they’re already at the bottom of the social hierarchy, what have they got to lose? – and sometimes, they win. Don’t dismiss them as “just tech”, or “back office nerds”. It can mean a lot to a nerd to be treated as an equal by someone in sales or marketing. You will be surprised at how hard they go out of their way to deliver you technical features and functionality that would otherwise take half a year to wend its way through product management, if you are simply including and respectful. Nerds love to focus on the tech and geek out. That’s fine. Do NOT try to overrule them or demonstrate any kind of authority here. It will be perceived as you being out of your element and they will lose respect for you. Instead, educate them on the business, and explain how their work affects the business. This helps avoid “getting caught in the forest for the trees”, where nerds obsess over what can be perceived as irrelevant technical ideas. Like dogs, tech people can smell fear in nontechnical people and will use and abuse it as they are able to expand their fiefdoms within a company. The beginning. Company is nothing more than an idea, proof of concept, and some light traction (such as a few product orders or letters of intent to purchase). The company is financed by angel investors. Angel investors are high net worth individuals, who usually made their money in business, and then invest it into nascent startups to help them get off the ground. Work your network and relationships. This is how I got my first angel financing. Often times, angel investors will give you a chunk of money in exchange for a “convertible note”. What this means is that once your business gets to the next stage of funding, you can either repay them the amount they loaned you (with interest), or they can convert your debt to them into equity, but priced at a discount, usually 15% to 20%. For example, if they loaned you $10k and then your startup gets a $100k valuation, they would get approximately 10k / 80k = 12.5% of your company. These terms vary from deal to deal. By no means is this book an authoritative guide to angel deals; really, we just want to teach you enough to teach yourself. Your next steps here is reading the book What Every Angel Investor Wants You To Know. If a company can’t get money from angel investors, it may also look for an SBA or local government loan. Then you get to pre-seed. At this point, incubators tend to play a relevant role. The most famous incubators in the community are probably TechStars and YCombinator, but there are new entrants all the time, such as AngelPad. If you google for “list of tech incubators”, you’ll find lots of resources. Then you get to seed. At this point, seed stage venture capital firms are in play. They will want to see monthly revenues of at least $50,000 – that means your starting is actually grossing $50k in revenue directly, not just processing $50k worth of orders – and a path to 10x that. Then you get to the “Series” financing. Series A, series B, series C, series D, and so forth. Finally, you get to an “initial public offering” or IPO. This is when the investors become the public rather than venture capital firms. If you are interested in learning more about this, the next book on your journey is the definitive guide, Venture Deals: Be Smarter Than Your Lawyer and Venture Capitalist. It does a supreme job of explaining key terminology, everything from “participation” to “drag along rights” to “liquidation preference”. Venture Capitalists have to bet on a lot of companies so that one great success gives enough financial return on investment to make up for all their losses. Therefore, they expect that most of the companies they back will fail. Therefore, economically, the startups you work for are probably going to fail. CPC: Cost Per Click. How much you pay to get someone to click on one of your ads. CPA: Cost Per Activity or Cost Per Action. How much does it cost you to get a prospect to take a specific action, be it signing up, creating an account, participating in some meaningful way… this metric is defined in context of a specific behavior, and the cumulative cost associated with driving one marginal (additional) occurrence of said behavior. For example, at mobile app companies, CPA designates cost per installation. LTV: Lifetime Value. How much revenue you generate from a user or customer over the lifetime of its relationship with your company. CPM: Cost Per Thousand Impressions. The “M” in CPM comes from the Roman numeral for one thousand. CPV: Cost Per View. How much it costs to get someone to view your page. SEO: Search Engine Optimization. This is the art of getting your webpage to rank high in Google. There are a few technical things you can do to the HTML on your webpage to improve the SEO (outside the scope of this book, especially since it’s ever-changing) but the number one thing you want to do is: (a) write great content for humans, not robots and (b) get lots of authoritative people to link to your site. Getting lots of “spammy” links, such as by leaving random, irrelevant comments on websites with comments sections, is a bad way to do SEO. SEO can also be considered a verb. “SEO my page.” A good way to SEO is get The New York Times to write an article about your business and have them link to your site. Because The New York Times has years of credibility, a link from them is worth a lot more in search engine rankings than a link from a local paper. ASO: App Store Optimization. This is the art of getting your app to rank high when people search a relevant keyword in the app store. PPC: Pay Per Click. In the Advertising section above, we explain CPC. The Cost Per Click. Pay Per Click is the generic term used for advertising services that charge you in a CPC manner. PPC generally refers to Google’s AdWords, Facebook Ads, Bing Ads, and self-serve PPC platforms such as Reddit. You advertise on a PPC platform, but then you get charged in CPC. CAC: Cost to Acquire a Customer. Sometimes this is CCA, “Cost of Customer Acquisition”. Either way, it means the same thing: how much do we need to spend in order to acquire a new customer? In general, venture backed tech companies like to see a ratio of at least 3:1 between Lifetime Value (LTV) and Cost of Customer Acquisition– in other words, you need to make at least 3 times from a customer, over the lifetime of a relationship, what it costs you to acquire them. Don’t abuse email threads. If you’re replying to an email that’s many threads deep, rewrite the subject line so that it reflects the current topic of conversation, and only quote as much information as is necessary. A conversion rate is the percent of users who take a specific action. For example, if the specific action is clicking the “signup” button on the homepage, and out of every 100 visitors, 3 people click the button, then your signup conversion rate on the homepage is 3%. Your startup can be viewed through the lens of a series of conversion rates: conversion rate on homepage, conversion rate on user to paying user, conversion rate on paying user to referring customer, et cetera. In the late 2000s, startup impresario Dave McClure gave a presentation that made the rounds called Startup Metrics For Pirates. Dave was an early employee at PayPal and started his own Venture Capital firm (incubator) called 500startups. In his talk, he breaks down the “conversion” funnel as this: AARRR. Attention: Getting people to your product, whether it’s a website or app. Activation: Getting people to sign up for your website or install and setup your app. Retention: Once they use it, getting them to keep using it. If you think about it, the vast majority of tech startups are running a “business engine” that depends on getting users through this funnel in some way, shape or form. Let’s use Uber as an example. Attention: Get people to the Uber website. Spread the word about the Uber app: tv commercials, subway ads, ads on busses, etc. Activation: If you download the app and don’t start using it, you start getting email reminders. Retention: If you haven’t opened the app in a while, you get notifications about “discounts” and special deals. Revenue: Your first ride is free if a friend sent you the app, but thenceforth, you have to pay for ongoing Uber rides. Referral: Get a $5 Uber credit if you get a friend to download the app. Here’s your personalized link! When a product has enough users, it makes sense for startups to test two different versions of the product experience against each other. These are called “A/B”, “multivariate”, and “split” tests. If one version registers a “statistically significant” increase in desired actions, then that version becomes the control and new iterations can be tested. Nearly any step of any conversion funnel can be improved with testing. What follows are some tactics for improving your startup’s offering at any stage of the funnel. While this list is by no means comprehensive, its purpose is to provide illustrative, real-world examples to get your creative juices flowing. Write articles that appeal to your market. Publish them on social media aggregators. Hire a PR firm and develop high quality SEO backlinks. Put on publicity stunts – the CEO of Salesforce.com did this with a giant ice cube block once. Advertising: online, print, radio, television, physical, … the works! Get creative and figure out the economics. Remember, you want to keep LTV at > 3x CCA. Do a usability study and make sure people understand what your product (webpage? app?) is and how to use it. Make it easier for people to sign up by reducing hurdles. Send people a handwritten email or thank you note once they sign up. Run a Net Promoter Survey and survey anyone who is neutral or a detractor (they answer 1-8 on the 1-10 scale – explained elsewhere in this guide) – figure out the objections and improve experience. Send people in-app or email notifications. Call them up on the phone if it’s appropriate. Test different price points. I once doubled the price on a product I had, and then subscriptions dropped by fewer than 50%. I did it again, effectively quadrupling the price while decreasing conversion rate by less than 25%. You know when sometimes, you visit a website and then ads for that website or brand or products start following you around everywhere on the Internet? That is a result of something called “retargeting”. Retargeting, also known as remarketing, involves a relationship between the website and the advertiser that is tracked by cookies. “Cookies” are a must-known technical concept, but essentially, a cookie is simply a digital receipt. Cookies are a piece of information that websites are allowed to store on your computer. When you visit a website with retargeting enabled, you receive a cookie linking your visit to that website to an advertiser. The advertiser, or your computer, then shares this information with publishers on the Internet, so they know which ad to show you. Cookies are digital receipts. For example, proof that you visited a website, or proof that you logged in. If you want to learn more about cookies, search on Google or ask the authors. Websites you visit on the Internet, that show you ads, are known as Publishers. Social Media: Social Media is any media website where users contribute the majority of the content rather than a staff of writing teams. For example, Twitter: users tweet. Facebook: users share links and updates. YouTube: mostly, users record videos rather than a content production team. Reddit: users submit links and comments. Hacker News: users submit links and comments. Etc. When you participate in social media on behalf of your company, it is known as Social Media Marketing. If you write articles that you expect users to like and to discuss on social media, that is known as Content Marketing. Some Social Media companies also have their own PPC (Pay Per Click) platforms. Because buyers will use Google every step of the way to inform them on this process, you can target them effectively, and this is why Google makes so much money. You first have to figure out what language the prototypical buyers use to describe their thoughts and emotions and questions during each stage of the process, then you can write content containing those keywords (SEO, Content Marketing) as well as bid on searches containing those keywords (AdWords: Google’s PPC platform) to get buyers’ attention. Survey your customers and ask them how likely are they to recommend your product/service/brand to a friend, 1 through 10. (I personally like to use Delighted.com to deliver the survey automatically). “Promoters” are the 9s and 10s. “Passives” are the 7s and 8s. Detractors are the 1s through 6s. Calculate your NPS by taking % of promoters and subtracting % detractors. If it’s positive, you’re doing good. Here is how NPS is dealt with: follow up with all your users or customers who answered 1 through 6 (the detractors). Write them individual emails and ask for more feedback and express your sincerity to bring them to a better experience. Figure out the underlying issues and address them. While NPS is good, another way to measure your company’s referral rate is through viral coefficient. The entrepreneur Andrew Chen defines this as “For every user coming into your site, how many friends do they bring?”. Your analytics team can help you calculate this. Personas: This is the art and science of understanding who your users are. Although people in general are not an “average” of other people, in the startup world, when there’s 10, there’s more. If 10 people subscribe to your service, you can get 1000. If 10 people complain about an issue, 100 people are silently fuming and or moving on to a competitor. So personas are “archetypes” that help you guide your decision making in terms of product and marketing. These could be prototypical Personas for us, and it could guide the tone in our writing and our marketing. Minimum Viable Product: In the late 2000s, entrepreneur Eric Ries, the founder of IMVU, created a movement in the startup community called “Lean Startup”. Basically, it means that instead of asking your customers what they want and then building something for them, it means putting together the absolutely minimum solution that would solve their problem – and seeing if it works. If people pay money for that, then it’s a Minimum Viable Product. If you want to learn more about this, read Eric’s book The Lean Startup or Steve Blank’s book, Four Steps To The Epiphany which heavily inspired Eric. Product Market Fit: In the late 2000s, Marc Andreesen, one of the early employees at Netscape and the brand behind the VC firm Andreesen Horowitz (abbreviated A16Z), wrote a seminal blog post about “Product Market Fit”. PMF is what happens when the product the startup creates aligns with the needs of the market. When this happen, the startup tends to grow extremely rapidly. This often results in billion dollar companies, and it’s when overnight success happens. This is also how “disruption” happens: the functionality of a product suddenly meets the requirements of the market, and is a better solution. A rule of thumb: companies are said to have achieved Product Market Fit when 40% of their users would be “very disappointed” without your product/service. Disruption: Clayton Christensen, who is known for being a Harvard Business School professor, has written many books on business that have great influence and are revered in tech. One such book is The Innovator’s Dilemma and it explains why big companies can’t innovate. The reason is this: big companies need to grow at 10% y/y to keep shareholders happy, so they need to go after bigger opportunities and have to ignore the small opportunities. Startups begin as solutions to small opportunities and then grow into solutions for larger opportunities. Big companies then buy startups once the market has grown and startups have taken all the risk off the table. Either that, or the startups IPO and become big companies in their own right. Startups(products) are represented by the curve and markets are represented by the straight lines. Therefore, product market fit happens at an intersection. Analytics: Business legend Peter Drucker says, “What gets measured, gets managed”. Metrics, or KPIs, are super important to startups. Often times, startups will use Google Analytics or Mixpanel to measure these, and they will supplement with custom dashboard. Many people feel that the most important metric for a startup is growth: how fast is revenue (and if no revenue, users) growing, from week to week. Yes, startups move from week to week – big companies move from quarter to quarter. There are basically two schools of software development. The old school was called “waterfall”. A product team came up with a coherent vision for a product, with a complete, fixed specification for the entire product. Then, the team spent a year or so building it, and then shipped it by printing it onto a CD Rom and packaging it for distribution through distributors. As the years went on, the cycles became shorter, like the span of a few months. And instead of CDRom, software started being delivered over the Internet. But the bottom line is that it was slow, and startups decidedly don’t work this way. The new school is called “agile”. Since companies can distribute their own software (through “software as a service”, or SaaS), either on their own infrastructure (server farms), through app stores (App Store, Google Play), or through shared server space (the cloud), they can deploy and make changes much faster. This has resulted in ethoses like “move fast and break things” (-Facebook) and the development of new engineering techniques for continuously updating one’s tech. These buzzwords are “continuous integration” and “continuous delivery”. Whereas a “Waterfall” team might have a year-long development cycles, “agile” teams’ cycles are much shorter and tend to be two to four weeks long. This usually consists of a “sprint planning session” (where the team meets up to decide what tasks should be done), a work cycle, where team members indicate what work is in progress through the moving of “cards” in through a “kanban board”, and then ideally, a “retrospective” at the end to discuss what went right and what went wrong. Unfortunately, very few teams actually adhere to best practices and “retrospectives” are rare in practice. Ideally, this is just a quick status report meeting. It’s “standing up” so we get through it quickly. In practice, few managers know how to effectively run a standup meeting, so time is wasted as people go in depth on topics during the group’s time. However, when standup works correctly, you can really keep your finger on the pulse of the group’s output and whether you are going to complete all the goals you set out to during your sprint planning. Agile teams tend to use the following software programs: Trello and JIRA. The company that makes JIRA recently bought Trello. You have probably heard the term “the cloud” a lot and are wondering what it means. The answer is servers. Back in the day, companies would have to buy their own server to deploy their software services. This would be really expensive, an intensive capital cost, and created a barrier to entry: only funded startups could afford servers. Not only was there the cost of the hardware, but there was the cost of maintaining it (sysadmins, techs). Nowadays, companies like Amazon, Microsoft and Google have gone ahead and bought tons and tons of servers and put them in their own data centers. In doing so, they have achieved Economies of Scale: they pay less per computer than we would. So, it makes sense to rent someone else’s servers rather than buy your own. “Cloud” is just an idea of reducing costs by renting other people’s computers rather than your own. If you are “deploying in the cloud”, you are hosting your website on rented computers (probably from Amazon, Microsoft or Google). If you are “running analytics in the cloud”, you are borrowing computer time (probably from Amazon, Microsoft or Google) in order to do your computation – you don’t actually own the computers. Cloud = other people’s hardware. In computing there are two important concepts: the “client” and the “server”. The server is the computer that stores all the information and the database and does processing. The client is the computer that interacts with the user. A web browser is a “client”. An iPhone app is a “client”. These “clients” talk to servers. A framework is a set of tools that have already solved problems that constantly come up in development. It’s like baking a cake from a mix instead of from scratch. But this metaphor falls short because nobody ever looks down upon a developer who doesn’t “bake from scratch”; however, inventing a new framework is akin to “baking a cake from scratch”. But making a new framework catch on is much rarer than successfully making a tasty cake! A “database” developer knows how to talk to databases. This person will speak both the languages SQL (using solutions such as MS SQL Server, PostgreSQL, MySQL) and “noSQL” (using solutions such as MongoDB). Many backend developers are also decent database developers. There are two types of QA, or Quality Assurance, developers. There are “testers”, who catch bugs by testing the website in a “Staging” environment (the version of the company’s tech that’s rolled out only to the company itself) before finding them in a “Production” environment (the version of the tech that everybody uses). A good QA will thoroughly document bugs (deviations from expected behavior) with lots of screenshots and information about how the bug was encountered (steps needed to reproduce). There is a second type of QA. These QAs will build software and write tests to catch bugs in an automated fashion. These are called “QA Engineers”. In many software teams, all engineers are expected to write their own automated tests as well. QAs like to use the software “Selenium” for automated testing of the user’s experience. Devops is a developer who deploys your app, either to an App Store or onto the Cloud. In the hierarchy of developer skill, “DevOps” is generally perceived to be above “QA” but lower than “Front End”/”Backend”/”Full Stack” engineers. This does vary somewhat from company to company, as a Principal QA Engineer will generally be considered higher, in corporate ranking and in pay, than a junior front end developer. Sometimes developers are both “front-end” and “back-end”. If they can do this, and they can also do basic deployment (“devops”), then they are considered a “full stack” developer because they can build applications soup to nuts. The key book here is Crossing The Chasm by Geoffrey Moore, but here are the bullet points. “Innovators” are going to be the first to try new technology, but they represent a very small percent of the total market. “Early Adopters” are aggressive in trying new solutions in order to get a competitive advantage. “Early Majority” wants to see social proof from Early Adopters in their niche having success with the new technology. “Late Majority” wants to see a full support ecosystem around the new technology: complementary services, third party add-ons, books, training services, support, a certification system for hiring employees trained in the new technology, etc. Finally, the “Laggards” are just late to adopt and only really change to the new tech when they are forced to. The best way to figure out whether your product (website, app, etc.) is usable is by doing “usability testing”. This is where you figure out the most important tasks for your website (for example: “Create an account”; “Find an item you look”; “Choose an item and go through the entire checkout experience”) and then hire random people to complete these tasks while you watch. The idea is you give them a task (a cue card) and then step back and ask them to do a little narrative of what they’re thinking while you watch them do the task (over their shoulder, on a projection screen, via a screenshare in the other room, etc.). If the users has any questions, tell them you will answer them after you’ve paid them. If you want a definitive manual, read the book Don’t Make Me Think by Steve Krug. You can recruit users for this for $50 off of Craigslist. It won’t take more than an hour. And the best part is that since humans tend to be similar, getting data from three different people is enough – and, those people don’t need to be representative of your market (though ideally they are). Just make sure that you actually act on their feedback and fix the bottlenecks and frustrations! Incidentally, this can actually be a great way to get customers, but it’s a clear path to improving the usability (UX: user experience) of your product. “Build it and they will come” does not apply to tech. Is “the tech” really the bottleneck in your business? You can string together almost anything using www.Zapier.com these days. Think outside the box. Do you really need to hire a developer? Have you validated your idea with paying customers and will they sign a letter of intent? Do you have a scalable strategy for marketing and selling? Prove it. If you want to get money to hire the developer, read the section titled “Stages of VC Financing” – we provide info on Angel investors . If you want more info – stay tuned! We’re going to be releasing an entire book dedicated to this soon. If you assume that your stock options are going to be worthless, you’re going to be a lot happier. Realistically, the vast majority of startup option packages tend to be worthless. The “Strike Price” of your options means how much you pay for each share of stock. The value of each share of stock is typically set during a financing round (e.g. a “Series A”). Once you leave the company, you usually get a fixed amount of time to exercise your options. If the options are illiquid (i.e., you aren’t allowed to sell them – the company can enforce that – and or nobody wants to buy them), then you often have a hard choice to make. Do you really want to gamble and bet that much money on the company you’re leaving? It is a confusing topic that is often not discussed clearly. This is unfortunate because it makes it harder to make good decisions. Many people learn the basic ideas through experience or reading, but equity compensation is a complicated and difficult area usually only thoroughly understood by professionals. Sadly, costly and avoidable mistakes are routine, and this hurts both companies and employees. This guide aims to improve that situation. It does not presume you have a law degree or MBA. The material is dense, but we have tried to present it in a way that both lawyers and non-lawyers can understand. If you’re thinking of working for a company that is offering you equity, it is critical to understand both the basics and some very technical details about the exact type of compensation you are being offered, including the tax consequences. Equity compensation and tax might seem like different topics, but they are so intertwined it is hard to explain one without the other. An understanding of the underlying rules is necessary for negotiating fair offers — on both sides. Of course, this guide can’t replace professional advice. But following the advice of a company lawyer, your lawyer, or your tax advisor can be easier if you understand these topics better. Unfortunately, there’s just no way you can “just trust,” sign lots of papers, and expect it will work out. Ask almost anyone who’s worked at startups, and they’ll have stories of how they or their friends or colleagues made costly mistakes because they did not understand the details. It is geared toward employees, advisors, and independent contractors who want to know how stock and stock options in C corporations work. This includes most startups. Typically startups and major companies are C corporations, and not LLCs or S corporations. LLC equity compensation is different and not covered in this guide (yet). It may also be useful for founders or hiring managers, who need to talk about equity compensation with employees or potential hires, or anyone curious to learn about these topics. The aim is to be as helpful for the absolute beginner as it is for those with more experience. When you negotiate compensation with a company, the elements to think about are cash (salary and bonus), benefits (health insurance, retirement, other perks), and equity (what we discuss here). Equity compensation refers to owning stock or having the right to buy stock in a company. In general, this guide is focused on equity compensation in corporations, not limited liability companies. The reasons for this are: (i) corporations are the most common form of startup company in the U.S. (LLCs are rarely used as the choice of entity for technology startups), and (ii) equity compensation for limited liability companies is dramatically different from equity compensation in corporations. To align incentives between individuals and the interests of the company. Equity compensation generally consists of stock or stock options or restricted stock units (RSUs) in the company. We’ll define these concepts next. Stock represents ownership of the company, and is measured in shares. Founders, investors, employees, board members, and others like contractors or advisors may all have stock. If you have stock, what ultimately determines its value is percentage ownership of the entire company, not the absolute number of shares. To determine the percentage of the company a certain number of shares represent, divide it by the number of outstanding shares. Generally, selling stock in a private company may be difficult, as the company is not listed on exchanges, and in any case, there may be restrictions on the stock imposed by the company. In startups, it is typical to hold the stock until the company is sold or becomes public in an IPO. A sale or IPO is often called an exit. Sales, dissolutions, and bankruptcy are sometimes called liquidations. In a few cases, you may be able to sell private company stock to another private party, such as an accredited investor who wants to become an investor in the company, but this is fairly rare. This is often called the secondary market. Sales generally require the agreement and cooperation of the company. For example, typically your shares would be subject to a right of first refusal in favor of the company (meaning, you couldn’t sell your shares to a third party without offering to sell it to the company first). Another possible roadblock is that private buyers may want the company’s internal financials to establish the value of the stock, and this typically requires the cooperation of the company. There have been some efforts such as SharesPost, Equidate, and EquityZen to establish a market around such sales, particularly for well-known pre-IPO companies, but it’s still not a routine practice. Quora has more discussion on this topic. Stock options (more specifically, “employee stock options” when given to employees) are contracts that allow you to buy shares, which is called exercising the options. Options are not the same as stock; they are only the right to buy stock upon and subject to the conditions specified in the option agreement. Importantly, they also expire when you quit working for the company (e.g., 90 days after termination of service) — so can effectively be worthless if you cannot exercise them before you leave. Amplitude, Clef, Coinbase, Pinterest, and Quora. Stock and stock options may be granted to you, but they come with a variety of conditions and limitations. One of the most significant conditions is that you usually “earn” rights to the shares or options over time or under certain events. This is called vesting. Vesting schedules can also have a cliff, where until you work for a given amount of time, you are 0% vested. For example, if your equity award had a one-year cliff and you only worked for the company for 11 months, you would not get anything, since you not have vested in any part of your award. Similarly, if the company is sold within a year, depending on what your paperwork says, you may also receive nothing on the sale of the company. Grants for advisors typically vest over a shorter period than employee grants, often two years. Advisor grants also typically have a longer exercise window post termination of service. Typical terms for advisors, including equity levels, are available from the Founder Institute’s Founder/Advisor Standard Template (FAST). Restricted stock units (RSUs) are a different type of compensation. RSUs are an agreement by the company to issue you shares of stock or the cash value of shares of stock on a future date. Each unit represents one share of stock or the cash value of one share of stock that you will receive in the future. The date on which you receive the shares or cash payment is the settlement date. They may vest according to a vesting schedule. The settlement date may be the time-based vesting date or a later date based on, for instance, the date of a company’s IPO. RSUs are more common for larger companies and options are more common for startups. RSUs are difficult in a startup or early stage company because when the RSUs vest, the value of the shares might be significant, and tax will be owed on the receipt of the shares. This is not a bad result when the company has sufficient capital to help the employee make the tax payments, or the company is a public company that has put in place a program for selling shares to pay the taxes. But for cash-strapped private startups, neither of these are possibilities. This is the reason most startups use stock options, not RSUs or stock bonuses or stock awards. RSUs are often considered less preferable to grantees since they remove control over when you owe tax. Options, if granted with an exercise price equal to the fair market value of the stock, are not taxed until exercise, an event under the control of the optionee. If a company awards you an RSU or restricted stock award which vests over time, you will be taxed on the vesting schedule. You have been put on “auto-pilot” with respect to the timing of the tax event. This can be a really bad thing if on the date of vesting the shares are worth a lot and consequently you owe a lot of tax. By the way, don’t confuse restricted stock units with restricted stock, which is an entirely different thing (described next). “Phantom equity” is a type of compensation award that references equity, but does not entitle the recipient to actual equity in the business. These awards come under a variety of different monikers, but the key to understanding them is knowing that they are really just cash bonus plans, but the cash amounts are determined by reference to a company’s stock. Phantom stock, is an example. A phantom stock award would be an award where you are entitled to a payment equal to the value of a share of the company’s stock, upon the occurrence of certain events. [Stock Appreciation Rights] (https://www.nceo.org/articles/phantom-stock-appreciation-rights-sars) are another example. An SAR gives the recipient the right to receive a payment the amount of which is calculated by reference to the appreciation in the equity of the company. Phantom equity can have significant value, but may be perceived as less valuable by workers because of the contractual nature of the promises. Phantom equity plans can be set up as purely discretionary bonus plans, which is less attractive than owning a piece of something. Warrants are another kind of option to purchase stock. As an employee or advisor, you may not encounter them, but it’s worth knowing they exist. They are generally used in investment transactions (for example, in a convertible note offering, investors may also get a warrant; or a law firm may ask for one in exchange for vendor financing). They differ from stock options in that they are more abbreviated and stand-alone legal documents, not granted pursuant to a “plan.” Also, because they are usually used in the investment context, they do not typically include service-based vesting provisions or termination at end of service, and are valid for a set number of years (e.g., 10 years). Now for the details around using stock and options for compensation. If companies do grant stock, it may be restricted stock. In this context, “restricted” refers to the fact that the stock will be subject to repurchase at the lower of fair market value or cost, which repurchase right lapses over the service-based vesting period. At some point early on, generally before the first employees are hired, stock will be allocated to a stock option pool. A typical size for this is 20% of the stock of the company, but it can be 10%, 15%, or other sizes. Once the pool is established, then the company’s board of directors grants pieces of it to employees as they join the company. Often, the whole pool is never used. The size of the pool is not just about how generous the company is with employees; it is determined by complex factors between founders and investors. Sometimes, to help you lower your tax burden, the company makes it possible to early exercise (or forward exercise) stock options. This means you exercise them even before they vest: you exercise them and you become a stockholder, but the company has the right to repurchase the unvested shares (at the lower of the price you paid or the fair market value of the shares) if you quit working for the company. The company will typically repurchase the unvested shares should you leave the company before the stock you’ve purchased vests. Stock options will expire after you leave a company (typically after 90 days). You might early exercise, or exercise at different times during your employment, depending on how much it costs and what the tax implications are. More on this below. Employment taxes — Social Security and Medicare taxes that are withheld from your paycheck. The Social Security wage withholding rate is 6.2% up to the FICA wage base. The Hospital Insurance component is 1.45%, and it does not phase out above the FICA wage base. Ordinary income tax applies in the situations you’re probably already familiar with, where you pay taxes on salaries or wages. Tax rates are based on filing status, i.e., if you are single, married, or support a family, and on how much you make, i.e. which income bracket you fall under. 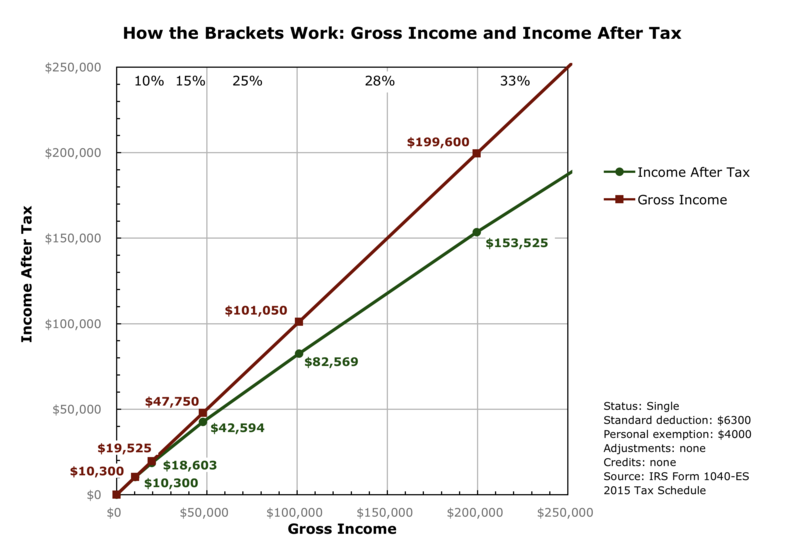 As of 2015, there are income brackets at 10%, 15%, 25%, 28%, 33%, 35%, and 39.6% marginal tax rates. Be sure you understand how these brackets work, and what bracket you’re likely to be in. There is sometimes a misconception that if you move to a higher bracket, you’ll make less money. What actually happens is when you cross certain thresholds, each additional (marginal) dollar money you make is taxed at a higher rate, equal to the bracket you’re in. It looks roughly like this (source). Long-term capital gains are taxed at a lower rate than ordinary income tax: 0%, 15%, or 20%. This covers cases where you get dividends or sell stock after holding it a year. If you are in the middle brackets (more than about $37K and less than $413K of ordinary income), your long-term capital gains rate is 15% (more details). AMT is relevant here because exercising incentive stock options can trigger AMT. In some cases a lot of AMT, even when you haven’t sold the stock and have no money to pay. More on this below. Section 1202 of the Internal Revenue Code provides a special tax break for qualified small business stock held for more than five years. Currently, this tax break is a 100% exclusion from income for up to $10M in gain. There are also special rules that enable you to rollover gain on qualified small business stock you have held for less than five years. Stock received on the exercise of options can qualify for the Section 1202 stock benefit. Generally, restricted stock is taxed when it vests as ordinary income. Of course, if the stock is in a startup with low value, this may not result in very much tax being owed. But if it is years later from when the stock was first granted, and the company is worth a lot, the taxes owed could be significant. However, the Internal Revenue Code offers an alternative, called a Section 83(b) election, which is an election to be taxed on the receipt of the property, even though you might not get to keep it since it has not vested. The presumption of the tax law would normally be that you do not owe tax until property you have received vests. With a Section 83(b) election, you’re telling the IRS you want to pay taxes early, on stock that is not vested yet, instead of paying as it vests. The election can potentially reduce your tax significantly: If the shares go up in value, the taxes owed on vesting might be a lot greater than the taxes owed at the time of receipt. An 83(b) election isn’t guaranteed to reduce your taxes, of course. For example, the value of the stock may not increase. And if you leave the company before you vest, you don’t get the taxes you’ve paid back. You must file the 83(b) election yourself with the IRS within 30 days of the grant or exercise, or the opportunity is irrevocably lost. Section 83(b) elections cannot be made on the receipt of a stock option. They can only be made on the receipt of actual shares of stock. Section 83(b) elections do not apply to vested shares; it only applies to stock that is not yet vested. Thus, if you receive options that are not early exercisable, which you cannot exercise until vested — then an 83(b) election would not apply. Founders and very early employees will almost always want to do an 83(b) election upon the receipt of unvested shares, since the stock value is probably low. If the value is really low, and the taxes owed are not that great, you can make the election without having to pay much tax and start your capital gains holding period on the shares. The startup pays for an appraisal that sets the 409A, typically annually or after events like fundraising. In practice, this number could be low or high. A company wants the 409A to be low, so that employees make more off options, but not low enough the IRS won’t consider it reasonable. Typically, the 409A is much less than what investors pay for preferred stock; for example, it might be only a third of the preferred stock price. Startups generally decide to give ISOs or NSOs depending on the legal advice they get. It’s rarely up to you which you get, so you need to know about both. There are pros and cons of each from both the recipient’s and the company’s perspective. ISOs cannot be granted to non-employees (i.e., independent contractors). When you get stock options and are considering if and when to exercise them, you need to think about the taxes. In principle, you need to think about taxes (1) at time of grant; (2) at time of exercise; and (3) at time of sale. If you are granted ISOs or NSOs at a low strike price, and the bargain element is zero, then you may be able to exercise at a reasonable price without triggering taxes at all. So assuming the company allows it, it makes sense to early exercise immediately (buying most or all of the shares, even though they’re not vested yet) and simultaneously file an 83(b) election. Section 83(b) elections are elections to be taxed on the receipt of property even though you might have to forfeit or give back the property to the company. You can make an election on the receipt of stock, but you cannot make the election on the receipt of an option or an RSU because options and RSUs are not considered property for purposes of Section 83(b). ISOs are often preferred by startups as it’s supposed to be better for an employee from a tax perspective. This assumes that (1) AMT won’t be triggered and (2) you’ll get low long-term capital gains rate by holding the stock for the appropriate holding periods. However, often you either run afoul of the AMT trap, or don’t hold the stock long enough with the complicated 1 year + 2 year requirement, or the spread at exercise is zero or small, so the difference wouldn’t matter anyway. NSOs do have a slightly higher tax because of the employment taxes. Overall, it’s not clear the ISO is that much better for employees, so many people argue for NSOs instead. Even more confusingly, ISOs can make it harder to meet the long-term capital gains holding period. Many people expect early exercise together with an 83(b) election will help them hold the stock longer, to qualify for long-term capital gains. While this is true for NSOs, there is a murky part of the rules on ISOs that implies that even with an 83(b) election, the capital gain holding period does not begin until the shares actually vest. So, if you want to immediately exercise an option and file a Section 83(b) election, and you might have liquidity soon, it’s better if you can have it be an NSO. When you receive your shares you are taxed on their value at that time. If you are an employee, this means you have to write a check to the company to cover your income and employment tax withholding. If you receive an RSU when the stock is of little value, you cannot elect to be taxed on the value of that stock when you receive the RSU — you pay taxes at vesting time, based on the shares’ value at that time. You will owe tax when you receive the shares — even though they are illiquid. You can’t minimize the impact of an increase in value of the underlying shares between the date you receive the RSU and the date it is settled. RSUs are less attractive than options from a tax point of view because you cannot make an 83(b) election with respect to an RSU. In contrast, if you receive a stock option, as long as it is priced at fair market value, you will have no income upon receipt of the options, and your income tax and employment tax consequences will be deferred until you exercise — an event under your control for the most part. This section is a quick refresher on how companies raise funding and grow, as this is critical to understanding the value of a company and what equity in a company is worth. Bootstrapped: No funding — founders are figuring out what to build or starting to build with their own time or resources. Series Seed ($250K to $2 million): Figure out the product and market. Series A ($2 to 15 million): Scaling product and making the business model work. Series B (tens of millions): Scaling business. Series C, D, E, etc. (tens to hundreds of millions): Continued scaling of business. It is critical to understand risk and dilution to know the possible future value of equity. This article from Leo Polovets gives a good overview. How much money has the company raised? In what rounds, and when? Will it likely raise more capital soon? It takes quite a bit of know-how to be able discuss, understand, and evaluate equity compensation offers. If you don’t yet have an offer, see the sections below on evaluating a company and negotiation, as well. Stock value: The value the company will have in the future, which depends on the value of the business, and the number of shares you own. Vesting and liquidity: When you actually will own the shares and when you’ll be able to sell them. Tax: Both purchase and sale of stock can require that you pay taxes — sometimes very large amounts. Also, there are several kinds of taxes: Income, capital gains, and AMT. Knowing how many shares of stock or stock options is meaningless unless you know the number of outstanding shares. What matters is the percentage of the company the shares represent. Typically it would be in percent or basis points (hundredths of a percent). Some companies don’t volunteer this information unless you specifically ask, but it’s always a fair question, since without it, the offer of shares is almost meaningless. In some cases, high taxes may prevent you from exercising, if you can’t sell the stock, so you could effectively be forced to walk away from the stock if you can’t afford to exercise. What set of shares was used to compute that percentage (i.e. is this really the percentage of all shares, or some subset)? What did the last round value the company at (i.e. the preferred share price times the total outstanding shares)? If you don’t yet have an offer, it’s important to negotiate firmly and fairly to get a good one. A guide like this can’t give you personal advice on what a reasonable offer is, as it depends greatly on your skills, the marketplace of candidates, what other offers you have, what the company can pay, what other candidates the company has found, and the company’s needs and situation. However, this section covers some basics of what to expect with offers, and tips on negotiating an offer. Most companies, especially well-established ones, give roughly equal treatment to candidates. But even so, harder negotiators, or ones that are more sophisticated, can often get better offers. For very early stage startups, risk is higher, offers can be more highly variable, and variation among companies will be greater, particularly on equity. The dominant factors determining equity are what funding stage a company is at, and your role. There are no hard and fast rules, but for post-series A startups in Silicon Valley, this table, based on the one by Babak Nivi, gives rough ballparks equity levels that many think are reasonable. These would usually be restricted stock or stock options with standard 4-year vesting schedule. These apply if each of these roles were hired just after an A round and are also being paid a salary (i.e. not already founders or hired before the A round). The upper ranges would be for highly desired candidates with strong track records. For post-series B startups, equity numbers would be much lower. How much lower will depend significantly on size of the team and valuation of the company. Seed-funded startups would be higher than the above numbers, sometimes much higher if there is little funding. One of the best sources of information about what is reasonable for a given company and candidate is to look at offers from companies with similar profiles on AngelList. A 2014 survey of AngelList job postings by Leo Polovets has excellent summary of equity levels for the first few dozen hires at these early-stage startups. Companies will always ask you what you want for compensation. And you should always be cautious about answering. If you name a number that you’ll accept, you can be fairly sure the company won’t exceed it, at least not by much. If you are experienced and know your value, it’s often in your interest to state what sort of compensation and role you are looking for, to anchor expectations. You might even share your expectations early in the process, so you don’t waste each other’s time. Discuss what your compensation might be like in the future. No one can promise you future equity, salary, or bonuses, but it should be possible to agree what they will look like if you have outstanding performance and the company has money. Always negotiate non-compensation aspects before agreeing to an offer. If you want a specific role, title, opportunity, visa sponsorship, special treatment (like working from home), or have timing constraints about when you can join, negotiate these early, not late in the process. Get all such additional agreements in writing, if they are not in your offer letter. If you’re going to be a very early employee, consider asking for a restricted stock grant instead of stock options, and a cash bonus equal to the tax on those options. This costs the company a little extra paperwork (legal costs), but then you won’t have to pay to exercise, and then if you file an 83(b) election, you’re simplifying life, eliminating the AMT issues of ISOs and maximizing chances of qualifying for long-term capital gains tax. Getting multiple offers is always in your interest. If you have competing offers, sharing the competing offers can be helpful, if they are good. Dragging out negotiations excessively so you can “shop around” an offer to other companies is considered bad form by some people, so it’s thoughtful to be judicious, and try to time things at once to the extent possible. Never accept an offer verbally or in writing unless you’re ready to stand by your word. In practice, occasionally people do accept an offer and then renege, but in the United States, this is considered a very bad thing to do. It puts the company in a difficult position (as they may have declined and lost other candidates based on your acceptance), and will hurt your reputation. Robby Grossman gives a good overview of equity compensation and negotiation suggestions. Exercise and hold: You can write the company a check and pay any taxes on the spread. You are then a stockholder, with a stock certificate that may have value in the future. As discussed above, you may do this “early”, even immediately upon grant, before vesting (if early exercise is available to you), sometime after vesting, or after leaving the company, as long as the exercise window is open. Recall that often the window closes soon after you leave a company, e.g. 90 days after termination. Wait until acquisition: If the company is acquired for a large multiple of the exercise price, you may then use your options to buy valuable stock. However, as discussed, your shares could be worth next to nothing unless the sale price exceeds the liquidation overhang, since preferred stock is paid up first. Secondary market: As discussed above, in some cases it’s possible to exercise and sell the stock in a private company directly to a private party. But this generally requires some cooperation from the company and is not something you can always count on. Note that some of these scenarios may require significant cash up front, so it makes sense to do the math early. If you are in a tight spot, where you may lose valuable options altogether because you don’t have the cash to exercise, it’s worth exploring each of the scenarios above, or combinations, such exercising and then selling a portion to pay taxes. In addition, there are a few funds or individual investors who may be able to front you the cash to exercise or pay taxes in return for an agreement to share profits. Alex MacCaw’s guide includes a few more detailed example scenarios. An Employee Innovations Agreement or Proprietary Information and Inventions Assignment Agreement or similar, which concerns intellectual property. Instructions and template for early exercise and 83(b) election, if applicable. Do not accept an offer of stock or shares without also asking for the exact number of total shares (or, equivalently, getting the exact percentage of the company those shares represent). It’s quite common for some companies to give offers of stock or options and tell you only the number of shares. Without the percentage, the number of shares is meaningless. Not telling you is a deeply unfair practice. A company that refuses to tell you even when you’re ready to sign an offer is likely giving you a very poor deal. If you’re looking at an offer, work out whether you can and should early exercise, and what the cost to exercise and tax will be, before accepting the offer. If you join a company right as it raises a new round, and don’t have the chance to exercise right away, they may potentially issue you the options with the low strike price, but the 409A of the stock will have gone up. This means you won’t be able to early exercise without a large tax bill. In fact, it might not be financially feasible for you to exercise at all. Vesting starts on a vesting commencement date. Sometimes stock option paperwork won’t reach you for months after you join a company, since it needs to be written by the lawyers and approved by the board of directors. This usually isn’t a big problem, but do discuss it to make sure the vesting commencement date will reflect the true start date of when you joined the company, not when the stock option is granted. If you’re going to early exercise, consider it like any investment. Don’t believe every projection about the value of the company you hear. Founders will tell you the best-case scenario. Remember, most startups fail. Do your research and ask others’ opinions about likely outcomes for the company. It may not be common, but some companies retain a right to repurchase (take back) vested shares. It’s simple enough to ask, “Does the company have any repurchase right to vested shares?” (Note repurchasing unvested shares that were purchased via early exercise is different, and helps you.) If you don’t want to ask, the fair market value repurchase right should be included in the documents you are being asked to sign or acknowledge that you have read and understand. (Skype had a complex controversy related to this.) You might find a repurchase right for vested shares in the Plan itself, the Stock Option Agreement, the Exercise Agreement, the Bylaws, the Certificate of Incorporation or any other stockholder agreement. Here are some costly, common errors to watch out for on the taxation side. One of the most serious tax-related mistakes you can make is to exercise ISOs without first knowing the impact on your AMT obligations. If there is a large spread between strike price and 409A value, you are potentially on the hook for a very large tax bill — even if you can’t sell the stock. This has pushed people into bankruptcy. It also caused Congress to grant a one time forgiveness, but the odds of that happening again are very low. Understand this topic and talk to a professional if you exercise ISOs. If you exercise your options, and your income had been consulting, not employment (1099, not W-2), you will be subject to the self-employment tax in addition to income tax. Self employment taxes consist of both the employer and the employee side of FICA. Meaning, you will owe the Social Security tax component, 6.2%, up to the FICA wage base, and you will owe the Hospital Insurance component, 2.9% on all of the income. Thoughtfully decide when to exercise options. As discussed, if you wait until the company is doing really well, or when you are leaving, it can have serious downsides. Many thanks to all Open Stock Option Guide contributors. and to many commentators on Hacker News. The original authors are Joshua Levy and Joe Wallin. This guide and all associated comments and discussion do not constitute legal or tax advice in any respect. No reader should act or refrain from acting on the basis of any information presented herein without seeking the advice of counsel in the relevant jurisdiction. The author(s) expressly disclaim all liability in respect of any actions taken or not taken based on any contents of this guide or associated content.